I Still Enjoy a Good Laugh! 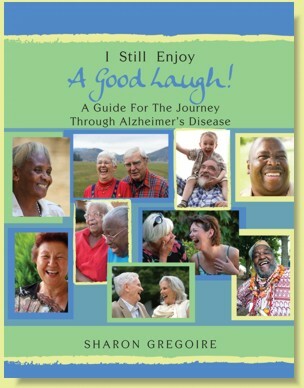 A Guide For The Journey Through Alzheimer's Disease was written by occupational therapist Sharon Gregoire to provide a person just diagnosed or living with early stage dementia an opportunity to record his or her preferences, hopes and fears, and life details. This book can be used both by the individual and by caregivers, to keep the identity of the person intact and ensure his or her wishes are known and followed. Consider for MindStart high activity level. "Life story books aide memory for people with dementia"
Therapist Tip: Life Story books help the memory of people with dementia and help to preserve their true identity. The prompts in this book help patients and caregivers to fill in all the important life aspects about that person. This book can become very important when the person can longer recall these details and can be used to educate outside caregivers and for prompting reminiscence. Love this book, it really comes in handy! I give it the family members to fill out & it really comes in handy during treatment sessions! I also offer a copy to family members for themselves..they maybe in their patents shoes some day and understand the importance of these questions! I have been using this book with my mom who has recently been formally diagnosed with dementia. She is unable to read it now. However, I am still able to use it to spark conversation and then write her answers in the book. I was not expecting my mom's emotional reactions to some questions. If you will be using the book the way I am, then that may be a possible reaction to plan for (work on at home instead of over dinner in a restaurant).